Last modified on November 27th, 2014 by Joe. 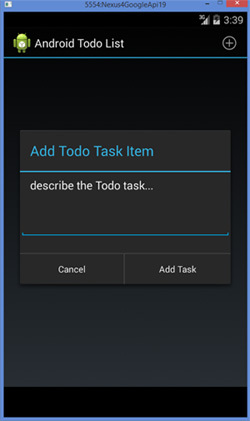 This Android tutorial is to walk you through to create a todo list Android application. 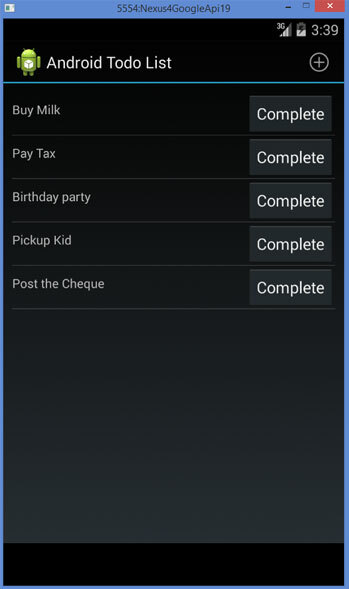 We will be using the Android SQLLite database to store and retrieve the todo list items. A recent web application and its mobile application that I liked very much is Google Inbox. It is certainly worth a mention in a todo list tutorial. Google has converted the Email into a whole big todo list with cool features. I liked the way they have envisioned it and certainly helps me to prioritize and execute. In this tutorial, we will see how to build a basic trimmed down todo list Android application and you can build on top of it and make it usable. Following is the AndroidManifest.xml and its just straight forward. We are using a ListView to display the todo list items. We have seen about displaying list items in a previous Android ListView tutorial. Following is the main and only Android Activity used for this example todo application. We display the todo list items with each item having a TextView and Button. TextView is to show the todo item and Button is to close / delete the same. This class is a SQLiteOpenHelper and just forks the embedded SQLite database. To know more about handling the SQLite database in Android refer the earlier written Android SQLite Database tutorial. Comments on "Android Todo List Application Tutorial"
Yaw yaw yaw, you forgot to add a menu XML file. You have also mentioned in the code getMenuInflater().inflate(R.menu.todo, menu); and in the switch case R.id.add_action_task. Where did yaw mention dem in da KODE ? Hello, thank you for the tutorial. Your onDoneButtonClick method doesn’t appear to delete the row, why is that? I’ve tried it but all the application does is crash when the button is pressed. Never mind. I figured it out. SQLite demands that all of the Strings be in all capital letters. When i try to build your project, I get an error showing android manifest not found. I can view the file alright. But it doesnt build. Comments are closed for "Android Todo List Application Tutorial".